The TS-432XU-RP is built to deliver high performance, flexible expansion capabilities and versatile applications at an affordable and cost-effective price for small/medium-sized businesses. Two 10GbE SFP+ ports are capable of high-speed transmission of time-critical business data and a PCI Express (PCIe) 2.0 ×2 slot (×4 length) provides flexibility for expanding connectivity and/or storage with M.2 SATA/PCIe NVMe SSDs, via QNAP's QM2 expansion cards. The TS-432XU-RP can be deployed to suit various needs for data storage, file backup, disaster recovery, containerized applications, surveillance, and more. The TS-432XU-RP is also equipped with a redundant power supply to ensure uninterrupted services. The built-in 10GbE SFP+ ports deliver high speed for mission-critical applications such as database hosting and VM storage. One PCIe 2.0 ×2 slot (×4 length) is available for adding a 10GbE port and/or M.2 SSD slots. With SSDs installed, Qtier auto tiering can be enabled to optimize storage utilization. The TS-432XU-RP is equipped with a AL-324 quad-core 1.7 GHz platform-on-chip (PoC), from the Alpine V2 AL3 product family powered by Annapurna Labs, an Amazon company. The included 2 GB RAM can be upgraded to a maximum of 16 GB for futureproofing its capabilities. With 10GbE connectivity and PCIe expansion, the TS-432XU-RP can provide performance of up to 1726 / 684 MB/s (unencrypted) and 1189 / 443 MB/s (with hardware-accelerated AES-256 volume encryption) to significantly boost business operations. With two built-in 10 GbE SFP+ ports, the TS-432XU-RP can immediately take advantage of high-speed 10GbE network infrastructure. The 10 GbE SFP+ ports can empower bandwidth-demanding tasks including databases, virtual machine storage, and large data backups. The TS-432XU-RP provides one PCI Express (PCIe) 2.0 ×2 slot (×4 length) for expanding NAS functionality, such as installing additional 10GBASE-T ports and M.2 SSDs (both SATA and PCIe NVMe*). QNAP offers a complete array of expansion cards for you to take advantage of the TS-432XU-RP's PCIe expandability, including QM2 expansion cards and single/dual port NICs. A well-rounded disaster recovery plan requires multiple layers of protection and backups to deliver peace of mind. The TS-432XU-RP supports snapshots to manually/automatically record the content of files and changes to them at the block level, allowing them to be quickly reverted in the event of corruption or accidental deletion. For added data security, the Hybrid Backup Sync app can help back up, restore and sync files to/from local external devices, remote NAS and public cloud services. The TS-432XU-RP supports SMB/CIFS, NFS, and AFP protocols for file sharing across Windows, Mac, Linux/UNIX networks. Data can be centrally stored on NAS and protected by rigid security measures provided by the TS-432XU-RP. The Windows AD and LDAP services enable system administrators to configure user permissions by using an existing Windows AD server, LDAP server or built-in LDAP service. To sync data across devices, including mobiles, simply install Qsync Central on NAS and Qsync clients on other devices to enjoy a fast, private, secure, and real-time file sync service with the TS-432XU-RP. The TS-432XU-RP can handle file backup tasks from Windows® PC and Mac. By using QNAP's NetBak Replicator backup utility, with a few simple clicks, you're all set. For macOS users, Time Machine can be set up to save to the TS-432XU-RP. Combined with snapshots and Hybrid Backup Sync, the TS-432XU-RP provides the solid foundations of a disaster recovery plan. The TS-432XU-RP provides an intelligent surveillance management system for real-time monitoring, video & audio recording, and playback to safeguard your work environment. You can even use USB webcams as affordable IP cameras with the free QUSBCam2 app. The TS-432XU-RP also supports QVR Pro, the next-generation QNAP NVR system, that allows you to arrange a dedicated, independent storage space for surveillance data on the NAS and leverage the advantages of scalability and storage manageability from QTS. *The maximum number of channels supported varies by NAS model, network configuration, and camera settings. For more information, visit https://www.qnap.com/go/qvr-nas-selector. The AL-324 PoC of the TS-432XU-RP supports hardware-accelerated AES-256 encryption of volumes, shared folders and LUNs to provide data confidentiality without sacrificing performance. Other security features include IP address filtering, virus and malware scan, and much more. You can also set access permissions to ensure only authorized users or apps can access specified folders. The QVPN Service, available from the App Center, can be utilized to deploy VPN connections to secure communications between your devices and NAS. 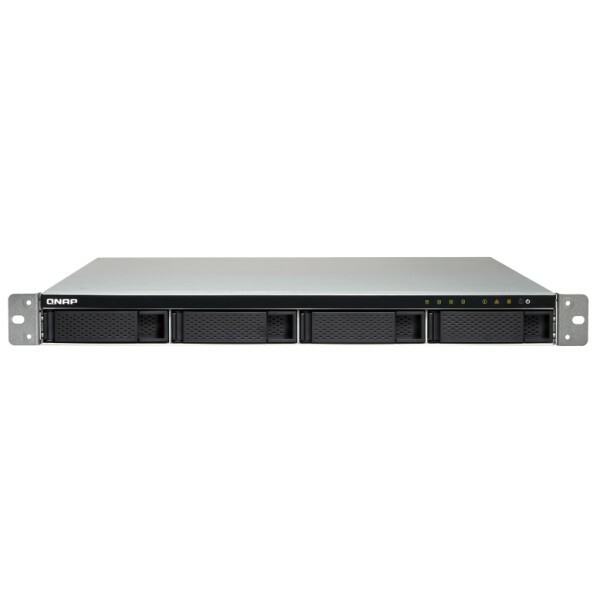 The TS-432XU-RP supports connecting a UX-800U-RP (8-bay) or UX-1200U-RP (12-bay) expansion enclosure to scale up the total storage space. The unused storage space on the TS-432XU-RP can also be used to expand the capacity of other QNAP NAS by using QNAP's Virtual JBOD (VJBOD). The TS-432XU-RP is equipped with a redundant power supply to ensure the maximum uptime of services for achieving high reliability. Combined with dual 1000BASE-T and dual 10GbE SFP+ ports, your businesses can easily maintain 24/7 operations, guaranteeing a cost-effective and reliable storage solution.